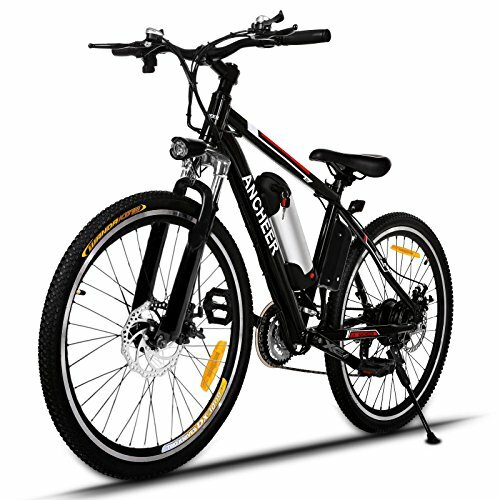 HIGH QUALITY MATERIAL - The Electic Bike use 100% aluminum alloy frame, the front fork is made of high-strength carbon steel and packed with premium comfort shock absorption; The front and rear wheels are double layer aluminum alloy wheel. LARGE CAPACITY REMOVABLE LITHIUM BATTERY - 36V Lithium Battery can be charged on or off the frame, equipped with smart lithium battery charger, fast charging only need 4-6 hours. Adapting to need of your long-distance riding. ERGONOMIC DETAILS DESIGN - Ergonomic handbar, adjustable seat and RST, anti-slip and wear resistant tire. The bright LED headlamp and horn are equipped for night riding. Meter has 3-speed smart button. We attention every detail of each component.